There’s a leprechaun funk shun at the end of this rainbow. Kronomyth 14.0: The Duke and the Fair Sister Funk in the all-night candy factory. 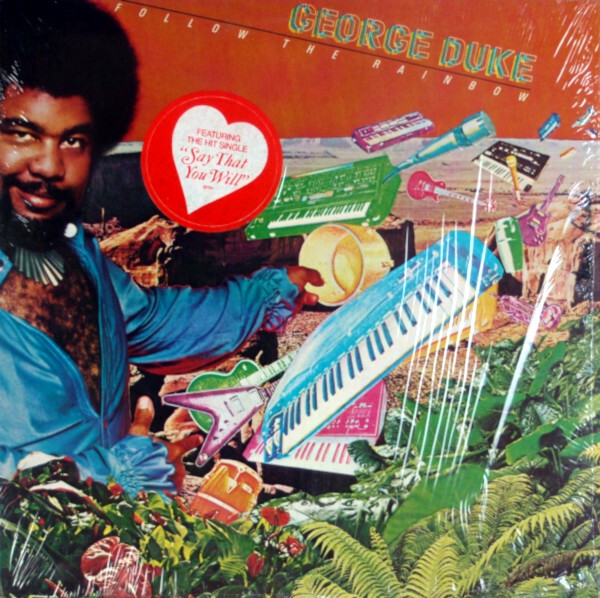 George Duke was content to follow funk for his fortunes, and fortune smiled back, as Reach For It and Don’t Let Go both reached the US Top 40. Follow The Rainbow follows the same formula, featuring high-quality funk from a committee that now included drummer Ricky Lawson alongside Icarus Johnson, Byron Miller, Sheila Escovedo, Lynn Davis, Josie James and Zappa alumnus Napoleon Murphy Brock. The transition from jazz to fusion to funk, while offputting to some jazz purists I suppose, is all part of the same family. Jazz is the studious older sister in glasses, fusion the free-spirited middle sister, and funk the popular younger sister who always has a date on Saturday night. You just need to follow the dots on Follow The Rainbow to hear the jazz undertones on “Sunrise” (my favorite track on the album) and “I Am For Real,” while “Corine” and “Festival” are more Latin-tinged fusion than funk. Of course, the funk is the most colorful part of the rainbow, and Duke & Co. know how to throw party: “Party Down,” “Funkin’ For The Thrill,” “Pluck.” My only complaint about the party is that Duke’s keyboards seem to get lost in all the chatter. There’s what sounds to be a Mini Moog solo on “Corine” and an electric piano solo on “Sunrise,” but that’s about it. Johnson slips in a nice acoustic guitar solo on “Festival” too, and this is probably an opportune moment to point out what an underrated guitarist he is; my ears always perk up when he’s playing on a record. The real stars of Follow The Rainbow are the vocalists, who make very sophisticated and spot-on harmonies sound like a group of people just having a good time. In listening to this record, I’m reminded of how much funk Frank Zappa incorporated into his music, and how both Duke and Frank were able to make very complicated music sound simple and spontaneous. That’s not to say that Follow The Rainbow is highbrow music; “Say That You Will” and “Straight From The Heart,” for example, are clearly commercial grabs that cozy up to disco. It is, however, an album that stands up well to close examination. Duke ends the record on an odd note, with a short fusion piece that gives the album its name, but has little to do with the preceding music. In a sense, “Follow The Rainbow” invites us to follow the connection back to Duke’s earlier works and see them as a continuous stream of creativity from the same source. It does make me long for the lost days of fusion, though I confess that for forty minutes I was having too good a time to notice it was missing at all. George Duke (vocals, Fender Rhodes, Yamaha electric grand, Hohner clavinet D-6, Arp Odyssey, Mini Moog, Oberheim and Prophet synthesizers, Funkosizers, Crumer strings, 9’ Yamaha grand piano), Napoleon Murphy Brock (vocals), Lynn Davis (vocals), Sheila Escovedo (percussion and vocals), Josie James (vocals), Charles Icarus Johnson (guitars), Ricky Lawson (drums), Byron Miller (bass, vocals on A3) with Roland Bautiste (guitars on A1/A2), Leon “Ndugu” Chancler (drums on B2/B3), Children of Distinction (choir on B2), Darrell “Sweet D” Cox (narration on A1/A3), Eric Culver (trombone), Kevin “Serious Biz” Dugan (bass), Jerry Hey (trumpet, flugelhorn), Larry Williams (alto & tenor saxophone, flute). Produced by George Duke; engineered and mixed by Kerry McNabb, B3 engineered by Dave Palmer. Design and concept by Tom Drennon. Illustration by John Laven. Photography by Bruce W. Talamon. Released on elpee and cassette in March 1979 in the US (Epic, JE 35701) and the UK (Epic, S EPC/40- 83336) with lyrics innersleeve; reached #56 on the US charts and #17 on the US R&B charts. Note: The US elpees were issued with the mid 70s orange Epic labels and the subsequent blue-black Epic script labels. It’s unclear to me if the blue-black labels are a later reissue or simply reflect different plant printings. Re-issued on compact disc on August 22, 2001 in Japan (Epic, ESCA-7884). Re-released on expanded Blu-Spec compact disc on August 11, 2014 in Japan (Epic, EICP 30034) with 2 bonus tracks. Re-released on 180g vinyl elpee in 2015 in the US (Speakers Corner). Re-issued on expanded, remastered compact disc on March 21, 2018 in Japan (Epic, SICP-5740) with 2 bonus tracks.